Requires the modeler to do some work on his own! I have to plead guilty to being an avid T-34 fan (those of snide disposition would probably claim it makes me an STFF or "Slobbering 34 Freak") as I have followed a lot of its career and researched a good deal of its early production difficulties and achievements. One of the more popular subvariants of the early model T-34s (only the Germans used the stroke 76 designator; the Russians never did and only added a dash 85 for the later variants with 85mm guns) for modelers due to its extreme detail changes. The T-34 began production at the Kharkov Steam Locomotive Factory No. 183 in December 1939. Later, in the summer of 1940, as orders began to grow for the new tank, a new production line opened at the "Krasnoye Sormovo" Factory No. 112. Finally, in 1941 a third line was added at the Stalingrad Tractor Factory ( STZ in Russian). Starting by assembling about 100 T-34 Model 1941 tanks with L-11 guns produced from "knock-down" kits supplied by Kharkov , this factory was to change over to mirror the first two and produce an identical version of the Model 1941 tank with F-34 gun. This quickly fell apart after the Germans invaded in 1941, and the name of the game soon became the production of the T-34 by the fastest possible means. While Factory No. 183 was withdrawn to Nizhniy Tagil in October 1941, the STZ stayed put and soon became the backbone of the defensive effort supporting the Stalingrad Front. Over the course of 1941-1942, the factory managed to produce 3,670 T-34 Model 1941 tanks to support the war effort. 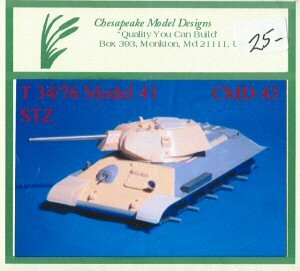 But as the crunch for time began to impact them, STZ began to modify the T-34 design to make it easier – and quicker – to build. Not having the massive and impressive automatic welding jigs for the hull as used in Nizhniy Tagil (which at their peak cut the time required to assemble a T-34 hull to only 20 man-hours) STZ used a unique method of notching the hulls to make it faster and more reliable for hand welding to make the hulls in a hurry. These notches were at the front, rear and top center of the hull sides. They also changed the turret to make it easier to construct. Indents were used at its lower front for alignment, the rear of the rolled sides were left at a sharp angle with the entire rear plate bolted on, and the recoil mechanism cover was left as a single plate (producing an angular or "chisel" front to it) in order to avoid having to have another step in bending the cover plate and cutting the sides to match a jig. Due to a shortage of rubber, they also were the first factory to go to an all steel cast wheel with internal rubber buffering. This was quickly found to make the tank an extremely rough rider over any distance and fatiguing to the crew from the noise and vibration; it was soon amended to use a combination of rubber tired and steel wheels with the rubber tires on the first and last road wheel stations. CMD has done most of the basic work on the kit for the modeler, and all the modeler needs to do other than use the parts in the kit is to make the notched section on the upper hull and fit the notched front and rear plates to the DML hull. This is not beyond the skills of most modelers, and very detailed directions are provided for that. The kit does not provide the standard production steel wheels, so the modeler is on his own for those items. I have not tried to see if Tamiya wheels fit on this kit, so cannot comment whether it is easier to use them, Zvezda wheels, or after-market ones. Overall this is a useful conversion kit, and one that is up to the high standards of CMD. Thanks to Bill Miley of CMD for the review sample.